OK was the highest selling brown sauce in London as late as the 1970s. Today, it is only produced for the Chinese market. Henderson Brand introduced A1 sauce in 1862. He employed two nephews, George and John Mason, who established a small factory of their own at King’s Road in Chelsea from 1880. Their first products, OK Sauce and beef and chicken extracts, were direct imitations of Brand products. Shortly afterwards, John left the company to leave George on his own. George Mason took on investors to form a private limited company called George Mason & Co in 1884. Mason evidently lacked managerial skills, and was forced to resign his directorship in 1891. The following year, Percy Cooper was appointed general manager, and three years later was promoted to Manager and Secretary. Cooper decided to focus production and marketing efforts upon OK Sauce. The lease on the Chelsea factory expired in 1896, and a new contract was taken at a larger premises at St George’s Hall in Walham Green, Fulham. The new factory was named the Chelsea Works. OK won the only gold medal for sauce at the Festival of Empire exhibition in 1911. George Mason & Co were purveyors by appointment to the House of Lords, and also supplied the House of Commons. An additional factory was opened at Southfields, Wandsworth in 1920 in order to cope with increasing demand for OK Sauce. Ownership of George Mason & Co was divided fairly evenly between the Cooper and Ripley families from 1920. Percy Cooper’s son Rex was appointed as general manager from 1925. OK Sauce used no cereal-based thickening agent, artificial colouring or added chemical preservatives. Both factories were closed in 1928 and production was centralised at a single larger site at Southfields, which was also named the Chelsea Works. Rationalised production at an efficient site allowed the company to lower prices for the consumer. OK Sauce contained raisins, cane sugar, mangoes, ginger, bell peppers, mace, nutmeg, cloves, British herbs, cinnamon, shallots, malt vinegar, garlic, lemons, oranges and tomato purée in 1929. It is interesting to note that the sauce was a product of international trade: only the herbs, shallots and vinegar came from the British Isles. Salt and vinegar were used for their preservative qualities in a time before widespread artificial refrigeration. Percy Cooper died suddenly in 1931, and Rex Cooper was appointed as the new managing director. Distribution of OK Sauce was mainly limited to Southern England and South Wales as late as the early 1930s. A dedicated northern sales team was established to boost sales nationwide from 1936. Wartime restrictions meant that by 1945 only OK Sauce, mustard, Worcester sauce and fruit chutney were produced. OK Sauce sales surpassed £1 million for the first time (about £21 million in 2015) in 1960. Reckitt & Colman were keen to enter the thick sauce market, and acquired George Mason for £826,575 (equivalent to £14.5 million in 2013) in cash in 1964. Rex Cooper joined the Colman’s board of directors. Rex’s son Brian was appointed managing director in 1965. Rex died the next year, leaving £77,514 (£1.3 million in 2013). The Southfields factory was closed with the loss of 150 jobs in 1969. Colman’s explained that Mason’s had “long since outgrown” the London factory, and relocated production to Norwich. By 1969 caramel and colouring concentrates were added to OK sauce for colouring, and gum tragacanth and manucol ester were added for appearance. The brown sauce market in Britain was highly regional as late as 1970, and OK claimed the largest share of the London market. OK Sauce appears to have disappeared from British shelves in the mid to late 1990s. Many of its customers switched to HP Fruity as the closest available alternative. Colman’s OK Sauce is still produced for catering trade purposes for only overseas [sic], and it was discontinued in the UK market a very long time ago. 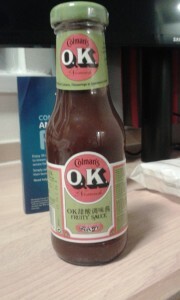 OK sauce may be found in large Chinese supermarkets and wholesalers in the UK. It retains its original packaging but with the addition of Chinese lettering. The label states that the sauce is manufactured in Great Britain by Colman’s of Norwich. As of 2019 OK is a dark brown sauce. It is fruity, peppery, tangy, sweet and sour. Its fruit content is listed as 39%. It has quite an Oriental profile, and perhaps contains star anise. It perhaps shares similarities with a puréed fruit chutney. The recipe appears to have changed over time. Mangoes are no longer contained in the sauce, and dates are now present. The label now claims that there are no artificial colours, flavourings or sweeteners added. Modified maize starch is added as a thickener. The sauce can be used in much the same way as HP, and I highly recommend it as an accompaniment to bacon or sausage. Chinese restaurants use it with shredded beef, shredded chicken and spare ribs. Interesting information on OK sauce history. My grandfather was Percy Cooper But I was never sure of the link between George Mason ( the official company name till my family sold OK to Colmans Mustard) I worked at the Southfields factory from 1960 to its demise in 1969 – happy days! I’d love to know if you have the OK sauce recipe. Enjoyed this bit of nostalgia. Growing up in the 1950s, I always preferred the taste and texture of OK sauce and OK chutney to the others on the market such as Tiger, Daddies, HP, Pan Yan etc. I seem to remember that it was a little dearer that some of the others by about 1d! M&S sauces are a good substitute nowadays. I particularly like their tomato sauce taste and texture. It’s not bland and slimy like some of the other brands.